The last Apple product to boast a stylus —or non-finger touch input implement —was 1993's Newton, a PDA lineup built around intuitive handwriting recognition technology. The series saw middling success before being axed by Steve Jobs upon his return to the company in 1998. After leaving the stylus in the rearview mirror, Apple pushed forward with multitouch on iOS and hasn't once looked back. That is until Apple Pencil. Apple CDO Jony Ive said Pencil is made for marking, not for executing banal user interface interactions. Apple largely rendered traditional styli obsolete with multitouch gestures in iOS, but there are certain scenarios —drawing being an example cited by Ive —where a writing implement bests even the most refined finger-based interface. Pencil is here to fill those gaps. 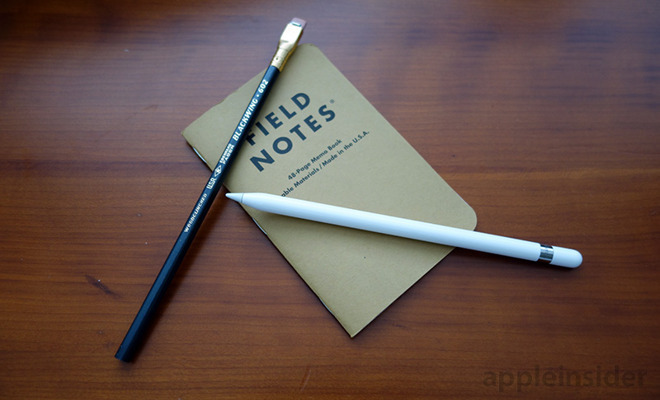 Pencil is an unassuming device, much more so than the iPad Pro to which it pairs. Crafted out of tough, white polycarbonate reminiscent of Apple's early iPod designs, Pencil has substantial heft and feels rock solid. There is no flex, no extraneous buttons and, save for the nib and removable end cap, no moving parts. It feels purposeful. The tip, or nib if carrying forward Ive's writing implement design metaphor, is made from a slightly flexible rubberized plastic. While not exactly malleable, the material is nowhere near as rigid as a common stylus point. When a nib gets worn down or damaged, it can be twisted off and replaced with a fresh tip. Apple includes one backup in the package. The gray plasticized compound gives under reasonable pressure, providing a bit of drag against iPad Pro's smooth glass screen. Overall feel is akin to a slightly dulled graphite pencil with a high hardness rating. Pencil is shaped to be immediately familiar to the user, but committing to a completely cylindrical format meant making concessions in ergonomics. Styli from Wacom and other professional imaging hardware companies boast thick bodies, sometimes shaped like hourglasses and wrapped in rubber sheathing. 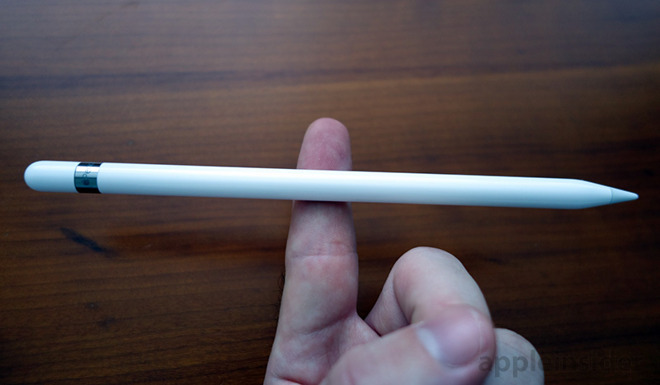 By comparison, Apple Pencil is a slender wand with a hard, slick body, not ideal for extended periods of use. 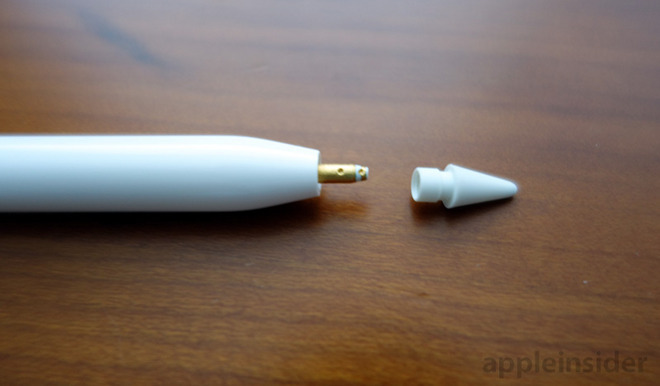 Apple's engineers were able to cram a good deal of electronics inside Pencil's slender shell. Most of the operational bits are found on a folded logic board situated toward the nib, itself outfitted with highly sensitive pressure sensors and specialized emitters used to determine degree of tilt. More than half of all available space inside the plastic shell is claimed by a tube-shaped 0.329-watt-hour lithium ion battery Apple claims is good for 12 hours of uptime. We found that estimate to be slightly conservative. The battery's mass helps achieve a weight distribution nearly 50/50 point-to-point, making Pencil feel more like a common writing instrument and less like a tablet accessory. For recharging, Apple built in a Lightning plug on the end opposite Pencil's nib. To keep the overall sleek aesthetic, a domed plastic cap is secured to Pencil's chassis via magnets. In our limited time with Pencil, we've almost lost this piece on two separate occasions, and Apple's retail kit doesn't include a replacement. Unfortunately, Apple found it unnecessary to build in an iPad attachment mechanism, meaning users have to carry Pencil separately in a bag or case. We understand that not all iPad Pro buyers intend to pick up an Apple Pencil, but all Pencil owners —for now —need an iPad Pro. It would have been nice to see an internal magnetic attachment point in iPad Pro's chassis similar to the coded magnets used to retain Smart Covers and cases, or even a magnet or loop in device-specific accessories. Charging is a simple, if not completely sophisticated, task of sticking Pencil's male Lightning plug into iPad Pro's receptacle, which incidentally trigger device pairing on first use. A quick charge takes only 15 seconds and yields 30 minutes of up time. Ive said the feature is built in to make usage more intuitive and to let users focus on drawing instead of fretting over battery life. A full recharge takes about an hour and saps a little over one percent of iPad Pro's capacious battery cells. Alternatively, Apple provides a female-to-female Lightning adapter for connecting to a standard iPhone or iPad wall charger. As AppleInsider noted in our first look, Pencil can be used as a simple stylus for pecking at apps, highlighting text and swiping through Web pages. There are a few notable limitations, however, including control over multitasking windows in Split View. As a capacitive input device, Pencil should be able to invoke Slide Over in iOS 9, but Apple is apparently using Pencil's unique digital signature, which aids in palm rejection, to prohibit such use. An interesting choice that likely has more to do with user experience than limitations in iOS. The real magic lies in Pencil's intuitive drawing capabilities. Onboard sensors communicate with matching components disposed under iPad Pro's display to log the slightest changes in pressure and tilt, which are translated to thicker lines, shading modes and more. When iPad Pro detects Pencil's aforementioned digital signature, a sampling subsystem boosts scan rates to 240Hz, thus reducing perceived lag. The tight hardware development process yielded a type of futuristic symbiotic relationship. Apple Pencil cannot stand alone without iPad Pro, and iPad Pro is not whole without Pencil. Along with ultra-fast response times, the Pencil-iPad Pro pairing incorporates the best palm rejection technology we've seen in a consumer device. Period. Along with the usual assortment of palm detection algorithms, apps like Apple's Notes proactively monitor for and fix erroneous marks. For example, resting a pinky finger on iPad's screen invokes a short stroke in Notes, but if Pencil is recognized by the display's hardware during the same action, that mark is retroactively erased. As of this writing, Apple's own Notes app is, perhaps unsurprisingly, the most fine tuned of current Pencil-supporting software. 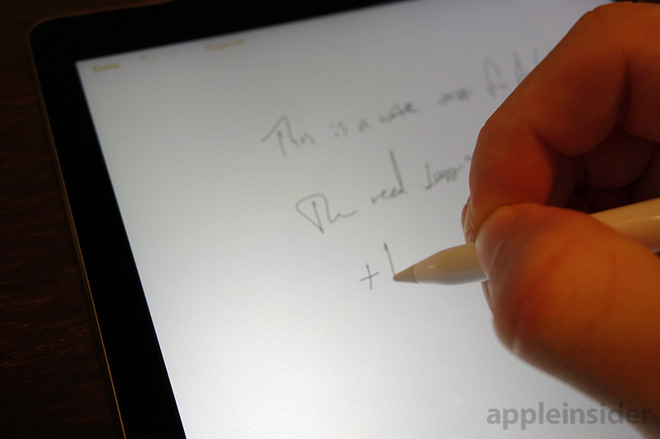 Notes exhibits imperceptible Pencil-to-screen latency. Other products sometimes take a split second to register the takeoff point when a stylus tip comes into contact with the tablet surface. With Pencil the moment of contact is immediate, emboldening the user with pixel-perfect accuracy. Even pulling long, roaming circles across the display at pace returns zero lag. It is with Notes' pencil tool that Apple Pencil's capabilities are made most apparent. Laying down material on virtual paper is an uncanny experience. The amount of virtual lead, and its opacity, is controlled by pressure, tilt and draw speed in a way that clearly mimics real life. Apple totally nailed it. Drawing in Notes is an additive process in that Pencil deposits a certain amount of material on each pass. 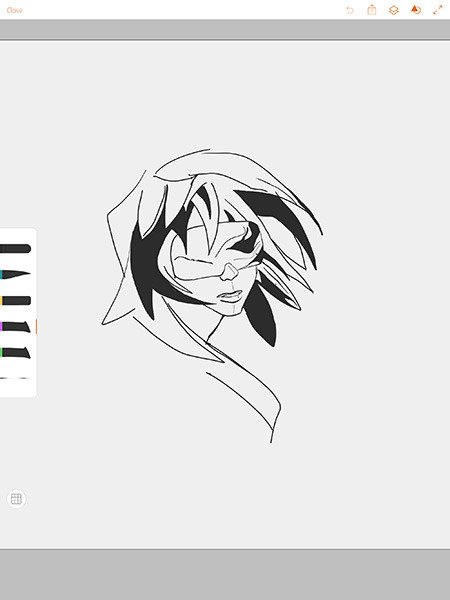 For clean lines, the app applies dynamic stroke smoothing, while tilt-based shading and pressure sensitivity are predictable to the point of being utterly intuitive. We were also impressed with Apple's seamless animations between sharp points to shading and back again. For all its benefits Notes is not a dedicated drawing app, meaning artists will have to look to third party programs like Adobe Sketch, Adobe Draw and Procreate for their creative needs. While these apps have granular tool control and a litany of brush styles, their implementation of Pencil is spotty. Procreate is in our view the most well integrated out of today's standalone offerings. The app features highly granular brush customization, an easy-to-use drawing interface and well thought out multitouch gestures. Using a few custom brushes, I was able to produce the rough sketch below in about ten minutes, and I'm most certainly not an artist. Procreate. Note: Disregard horrifying eyelashes. Adobe Photoshop Sketch is another great app, though quality results are harder to achieve due to a lack of tools. Users are able to select from a variety of pencils, pens, brushes, smudge tools and more, while each has its own set of customization options. 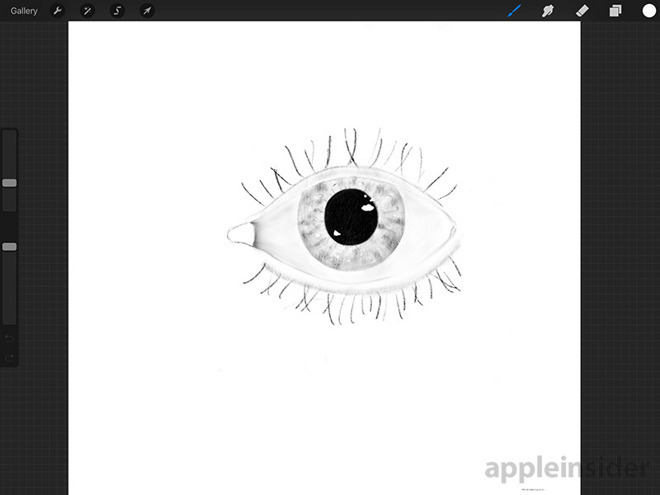 Adobe Illustrator Draw is similar to Sketch, but is designed to create vector graphics, a useful feature for illustrators looking to start a project on iPad and finish up on a professional desktop rig. Unfortunately, the first version of Draw suffers from noticeable lag. The exact cause is unclear, but it could have something to do with processing pressure, tilt and azimuth information into dynamically smoothed vector art. We had to dig deep to find Pencil's negative attributes, of which there are sparingly few. For example, the shell's slick exterior forces a tighter grip, which can be fatiguing after hours of use. Pencil's nib is also tiring. 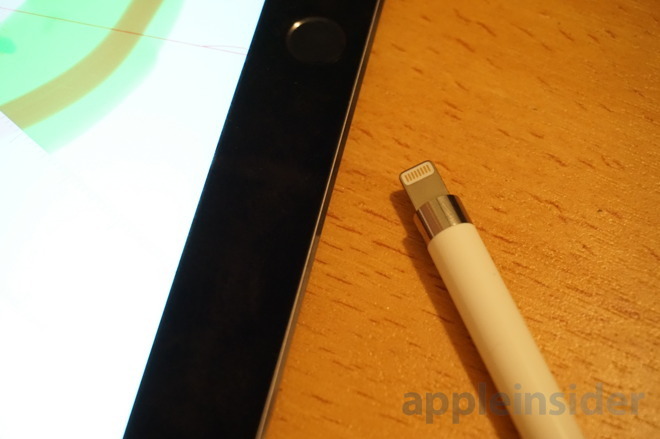 While vastly superior to hard plastic found on competing styli, Apple's version still slides freely across iPad's screen, meaning users can't rely on friction to bring Pencil to a halt. The sensation will be familiar to anyone who's used a stylus, but a lack of surface grip means hand muscles have to work harder for complete control. At $99, Pencil is hardly an impulse buy. 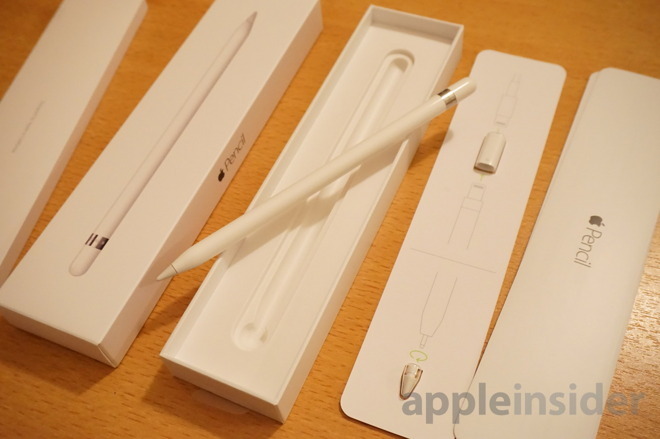 Indeed, Pencil is the main reason many customers are even considering the gigantic iPad Pro. As an art tool, Pencil is unmatched in the iOS ecosystem, and that lead should only increase as more developers build in Apple's APIs. Pencil was made for artists. The tablet workflow is not yet powerful enough to completely replace desktop software, but the iPad Pro/Pencil combo performs flawlessly for mockup work and on-the-go creation. 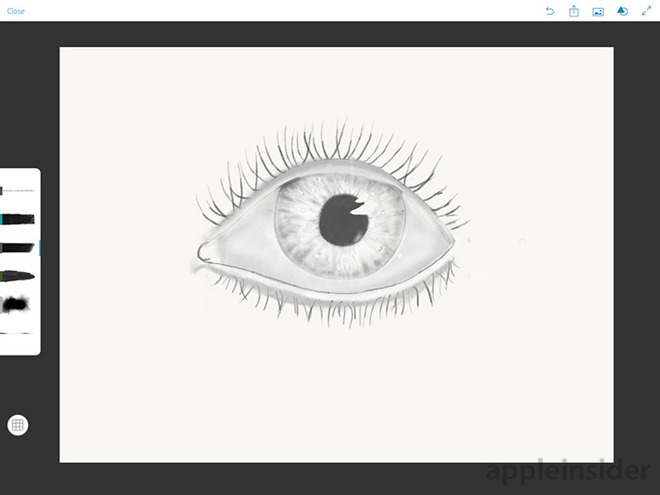 Apps like Astropad, which connects iPad to a Mac for use with pro apps like Photoshop, further blur the line between tablets and dedicated digital canvases. Education and business users will benefit to a lesser extent, especially in apps where note taking and markup features play central roles. The case for Pencil is less clear for casual users. There's no denying that Pencil is a hugely fun accessory to play with, but its overall utility for everyday use is questionable. Factoring in the price of an iPad Pro, however, the package is hardly worth a few doodles in Notes. 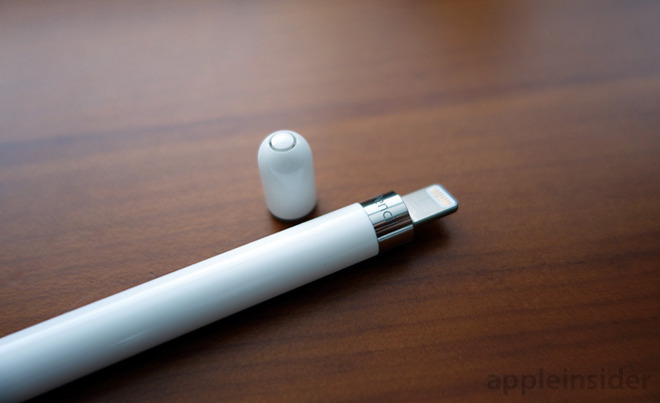 In short, Apple Pencil is the best stylus —gasp! —on the market, but remember you need a $799 iPad Pro to join in the fun. Apple Pencil is available for $99 through Apple authorized reseller B&H, as well as at Amazon.com and Apple Stores directly.